Are even more Transformers movies headed our way? 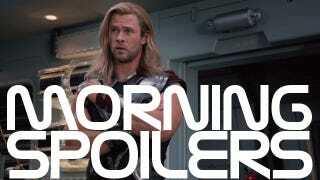 Plus tons more updates on the future of Marvel movies! Two more Transformers movies really might happen, with a surprising new star taking over the franchise. Cillian Murphy refuses to talk The Dark Knight Rises. Vin Diesel reveals some Riddick 3 concept art. What's going on with the American Akira remake? "Loki's definitively more menacing [in 'The Avengers']. In 'Thor,' he was a lost prince and there was a degree of vulnerability and confusion about his identity. In 'The Avengers,' he knows exactly who he is and is fully self-possessed. ['Thor' director] Ken [Branagh] and Marvel already had a clear take on the world they wanted to make, but I borrowed from both [Marvel and Norse]. In the Marvel mythology, initial incarnations of Loki just have him cackling on the rooftops. He's very much a two-dimensional villain. It was only in the Norse myth that you see how psychologically complex Loki seemed to be." "It's not an easily functioning team. A lot of the strength and uniqueness of the film comes in the fact that there's a lot of square peg/round hole fitting going on." "There's a scene where I say, 'You were made to be ruled' that smacks of an entitlement, arrogance and menace that sums Loki up pretty well. There's more where that came from." Yeah the talk now is that they are going to flash back to WWII and without going too much into, because I'm not supposed to say too much at all, but whatever they do I guarantee you this … it's going to be an awesome movie. The villain is going to be crazy, and it will be really terrific. The origin of Cap being in WWII is definitely paramount to the guys over at Marvel. "I think it's one of those great things with a really good script writer. What Damon did with that script is fantastic. It allows the audience in on more information than the characters in the film." In this case, my job is essentially to be Frank Miller. I have to, as an improvisational actor, be Frank Miller while simultaneously being Monahan. It's pretty cool because as a screenwriter, as a dramatist, what you're doing all the time is inhabiting characters and improvising. In writing drama, there's a great component of being an improvisational actor and there's also a component of being an improvisational writer who can inhabit another personality and deliver something in the correct tone. Frank Miller is emphatically Frank Miller. That's what I wanted to see in Sin City and that's what I want to see in Sin City 2. Here's the trailer for what is sadly the show's last ever episode, the second part of "The Man Who Never Was." In the aftermath of Peter's (Joshua Jackson) return, the situation escalates when the translucent shapeshifters return. As the threat intensifies, former Massive Dynamic scientist, Malcolm Truss (guest star Arye Gross), enters the fold, while Nina Sharp (Blair Brown) pays Walter (John Noble) a visit in the lab. Nov. 4: "And Those We've Left Behind"
Real-life spouses Stephen Root and Romy Rosemount guest-star in an all-new FRINGE, which marks the first time the accomplished actors have ever acted together. The Fringe team must find the pattern between tragic time loop anomalies. As the investigation unfolds, Raymond (guest star Root), an electrical engineer, and his wife, Kate (guest star Rosemont), a professor of theoretical physics, enter the picture. When a man mysteriously dies by an invisible force, his body rapidly begins turning ghostly white. The Fringe team learns that this is not an isolated incident, and there's evidence that links the predator to someone who passed away with an unknown genetic disorder. Meanwhile, Olivia (Anna Torv) suffers from migraines. In the Fall Finale, Olivia and Lincoln (Seth Gabel) take drastic measures to deal with the looming threat from the translucent shapeshifters, while helping Peter find his way home. Something "over there" occurs that hasn't happened since the universes were linked at the end of last season. Here's a sneak peek at the next episode, "Bloodletting." The first season was setting up the world, learning about it through Rick's eyes, 'cause obviously he was in a coma as the world was falling into the zombie apocalypse. This season we're able to delve into each of the cast members: who they are, what their fears are, what their hopes are. Are they giving into despair? Are they willing to fight? Do they have an opportunity to fall in love? ...It's interesting how Daryl is the character who's changed the most, morphing from redneck to leader. How does that happen? He was always in his brother's shadow. Now he can define himself. And truly, he's got the strongest skill set to survive in this environment. He's a survivalist. The rest are adapting to living without modern conveniences, but Daryl grew up that way. A crashing meteor wipes out all technology and wreaks havoc on the colony. Meanwhile, Maddy (Naomi Scott) and Reynolds (guest star Dean Geyer) are stuck out in the wilderness. Back at Terra Nova, Elisabeth and Skye must work together to save a life, Taylor tries to prevent Mira (Christine Adams) and the "Sixers" from invading, and a mystery man makes his presence known. Maddy starts interning for the colony's greatest scientist (guest star Robert Coleby), and her life is put in danger when she discovers a terrible secret. Meanwhile, Josh makes a deal with the devil in order to solidify his plan to bring his girlfriend from the future to Terra Nova. This season will take Chuck back to the basics, as he and his team go independent as Carmichael Industries. Without the help of the CIA or the Intersect in his head, Chuck is once again the underdog, relying more than ever on his wits, his team, and also on a new Intersect - Morgan Grimes. And as Chuck and Sarah begin life as newlywed spy partners, they're led to consider the future of their spy life. In addition, we're excited to have a new cast of guest stars on board, including Mark Hamill, Carrie-Anne Moss, and Cheryl Ladd. Who else could be Sarah's mom but an original Angel? Sam and Dean are once again on the FBI's "Most Wanted" list when two Leviathans clone the brothers and go on a killing spree. The subject of a nationwide manhunt, Sam and Dean need to drop off the grid so Bobby sends them to Frank Deveraux , a quirky surveillance expert, for help. Meanwhile, Bobby continues to search for a way to kill the Levianthans, or at least slow them down, so the real Winchesters can stop their evil doppelgangers.